Chatham Borough, New Jersey, U.S.
from the BBC programme The Food Programme, December 1, 2013. Alice Louise Waters (born April 28, 1944) is an American chef, restaurateur, activist and author. She is the owner of Chez Panisse, a Berkeley, California restaurant famous for its organic, locally grown ingredients and for pioneering California cuisine, which she opened in 1971. In addition to her restaurant, Waters has written several books on food and cooking, including Chez Panisse Cooking (with Paul Bertolli), The Art of Simple Food I and II, and 40 Years of Chez Panisse. Her memoir, Coming to my Senses: The Making of a Counterculture Cook was published in September 2017 and released in paperback in May 2018. She founded the Chez Panisse Foundation in 1996, and created the Edible Schoolyard program at the Martin Luther King Middle School in Berkeley, California. Waters serves as a public policy advocate on the national level for school lunch reform and universal access to healthy, organic foods, and the impact of her work in organic food and nutrition is typified by Michelle Obama's White House organic vegetable garden. Waters was born in Chatham Borough, New Jersey on April 28, 1944 to Charles Allen Waters, a Rutgers University graduate who was a management consultant, and Margaret Waters who was a stay at home mom. Alice graduated from the University of California, Berkeley after transferring there from UC Santa Barbara. She received a degree in French Cultural Studies in 1967. During her time at UC Berkeley, she studied abroad in France, where she shopped for local produce and prepared fresh foods simply in order to enhance the experience of the table. During her time in France, she says she "lived at the bottom of a market street" and "took everything in by osmosis". She brought this style of food preparation back to Berkeley, where she popularized the concept of market-fresh cooking with the local products available to her in Northern California. For her, food is a way of life and not just something to eat. During her time at UC Berkeley, Waters became active in the Free Speech Movement, which was sweeping across the campus. Waters worked on the congressional campaign of Robert Scheer, an anti-Vietnam War politician. She often cooked for and entertained her fellow campaigners. Waters eventually returned to Europe, where she first trained at a Montessori school in London, and then spent time traveling in Turkey and then in France once again. Principles of the Montessori method, which emphasize practical and hands-on activities for children, are evident in Waters' idea of "edible education" and her Edible Schoolyard, which engages children in the preparation of fruits and vegetables that they tend to with the supervision of their teachers. After training in London, Waters next traveled to Turkey, which she credits with influencing her approach to hospitality and deepening her respect for local communities. In his book Alice Waters and Chez Panisse, Thomas McNamee recounts Waters' experience in Turkey, where a young Turkish boy shared tea and a small bit of cheese with Waters and her traveling companions, even though he had very little. This small act of kindness had an effect on Waters's approach to hospitality and generosity in her own restaurant. From Turkey, Waters then returned to France, where she embarked upon a year-long journey. Her travels solidified her love of all things food and French and inspired her to return to California and open Chez Panisse. Waters counts Elizabeth David, the English cookbook author and writer, as one of her influences. She also credits Richard Olney, an American authority on French food who spent much of his life living in France, with influencing her simple, rustic cuisine. Olney introduced Waters to Lucien and Lulu Peyraud, owners of the Domaine Tempier vineyard in Provence. Lulu Peyraud's vineyard cooking significantly influenced Waters' cooking and her menus at Chez Panisse. In her foreword to Olney's book, Lulu's Provençal Table, Waters wrote: "Lucien and Lulu's warmhearted enthusiasm for life, their love for the pleasures of the table, their deep connection to the beautiful earth of the South of France – these were things I had seen at the movies. But this was for real. I felt immediately as if I had come home to second family." In addition, Waters has said that she learned Chinese cooking from Cecilia Chiang, and the two became lifelong friends. Waters has said that what Chiang did to popularize Chinese cuisine in America is what Julia Child did for French Cuisine. In 1971, Waters opened Chez Panisse, which she named for a favorite character in a trilogy of Marcel Pagnol films. From the beginning, the restaurant was a collaborative effort; one notable collaboration was with Jeremiah Tower, who created the recipes that she later published under her name. Tower took the organic ingredients and melded them into a more refined menu. Chez Panisse was intended to serve primarily as a place where Waters could entertain her friends. Realizing the difficulty in sourcing fresh, high-quality ingredients, Waters began building a network of local farmers, artisans, and producers, and continues to source the restaurant's ingredients through her local network. Waters opened the upstairs Chez Panisse Café, a concept championed by Tower, in 1980. Café serves an a la carte menu for lunch and dinner. In 1984, Waters opened Café Fanny, named after her daughter, a few blocks from the restaurant. Café Fanny, which served breakfast and lunch in a casual, European-café setting, closed in 2012. The Waters mainly focused on the importance of organic farmers. Through Chez Panisse foundation, the project called "Edible Schoolyard" was organized in order to make an environment for the students to grow their own products. Central to the operations and philosophy of Chez Panisse is Waters' and the restaurant's dedication to using organic ingredients. Waters has become a crusader for organic foods, believing that they are both better for the environment and for people's health in addition to tasting superior to commercially grown, non-organic foods. Waters became an organic devotee almost by accident, claiming that what she was originally after was taste. She says: "When I opened up Chez Panisse, I was only thinking about taste. And in doing that, I ended up at the doorstep of [organic farmers]." Waters' current organic food agenda includes reforming the USDA school lunch program to include organic, local fruits and vegetables and changing the way America eats, but her passion for organics started at her restaurant, where she discovered that organic ingredients were the essential element necessary to create delicious food. Waters' effort to promote fresh, sustainable food grown by local farms has extended into her work as a food activist and humanitarian. Waters has always been an outspoken supporter of the restaurant's approach to food, cooking, and supporting the local community, but has more recently formalized her efforts through the Chez Panisse Foundation. In celebration of the restaurant's 25th anniversary, Waters founded the Chez Panisse Foundation in 1996, whose mission is to transform public education by using food to teach, nurture, and empower young people. In particular, the Foundation has worked with the Berkeley Unified School District to develop a public school curriculum that is integrated with the school dining services and incorporates growing, cooking, and sharing food at the table into the school day in order to build a humane and sustainable future for the school's students. The Chez Panisse Foundation is a publicly supported 501(c)(3) organization. The primary work of the Chez Panisse Foundation has been to establish and sustain the Edible Schoolyard program at Berkeley's Martin Luther King, Jr. Middle School. The Edible Schoolyard was established in 1995 and is a 1-acre (4,000 m2) organic garden and kitchen classroom. Students at the middle school are involved in growing, harvesting, and preparing the foods from the garden, with the aim of promoting the environmental and social well-being of the school community. Waters' work at the Edible Schoolyard has also developed into her School Lunch Initiative, which has the broader goal of bringing school children into a new relationship with food by making a healthy, fresh, sustainable meal a part of the school day. The School Lunch Initiative is a collaborative project with the Center for Ecoliteracy, also in Berkeley, and is also the topic of a series of studies through the Center for Weight and Health, at UC Berkeley. The School Lunch Initiative is focused on bringing wholesome school lunch to the 10,000 students in the Berkeley Unified School District. In 2005, the Chez Panisse Foundation provided a grant to Berkeley schools to hire Ann Cooper as the Director of Nutrition Services for the district. Cooper and the Foundation eliminated almost all processed foods from the district and introduced organic fruits and vegetables to the daily menu, all while staying within the district's budget. Waters' vision is to teach subjects such as history, science, and art through the vehicle of food. In September 2010, the Center for Weight and Health at UC Berkeley, Center for Ecoliteracy, and Chez Panisse Foundation released an evaluation report on the School Lunch Initiative. The report tracked elementary and middle school students over three years to determine the effects of the School Lunch Initiative on children's eating habits and knowledge. The report found that students in schools with highly developed School Lunch Initiative components ate more daily servings of fruit and vegetables than students in schools with lesser developed programs, and that they scored higher on food knowledge assessments. Schools with highly developed School Lunch Initiative components integrated kitchen and garden classes into the school curriculum, in addition to overhauling the school lunch program. Obama's Let's Move campaign, which replaced her predecessor's literacy drive, addresses much of what Waters has been preaching...Chris Lehane, a political consultant who has worked for Al Gore and Bill Clinton, sees Waters as "the George Washington of the movement and Northern California as the 13 colonies...If you're going to pick a figure who's responsible for it all, it all comes back to her." In addition to the Edible Schoolyard in Berkeley, there are five affiliate Edible Schoolyard programs around the country. These include Edible Schoolyards in New Orleans, New York City, Los Angeles, San Francisco, and Greensboro, North Carolina. The Edible Schoolyard in New Orleans serves students in grades K through 8 from the Green Charter and Arthur Ashe Charter Schools. In addition to Open Garden, which includes the entire community in preparing a seasonal meal, the Edible Schoolyard has become a part of the school curriculum, and helps students learn about Creole cooking and indigenous food traditions. The affiliate program in New York City, located in Brooklyn at P.S. 216, will boast a newly designed kitchen and a four-season greenhouse in addition to a quarter-acre organic farm. P.S. 216 has nearly 500 students in grades K though 5, with 16% English language learners. The Greensboro affiliate program opened in 2009 at the Greensboro Children's Museum, and hosts a variety of weekend, after-school, and summer programs for children in the community. The program will also provide training and education for community parents and early childhood professionals. The Larchmont Charter Schools in Los Angeles incorporate several gardens into their four campuses, which infuse the school curriculum with real-life applications through gardening and science. Participation in the school lunch program at the Larchmont Charter Schools is mandatory, and often features a family-style lunch made from local and organic ingredients. The San Francisco Edible Schoolyard program is operated through the Boys and Girls Club in Hunters Point, where there is a distinct need for access to healthy food and nutrition education. In addition to hosting an 800-square-foot (74 m2) garden, the program hosts cooking classes and organizes trips to local farmers markets. Currently, Waters is working at the national policy level to extend free school meals to all public school children in the United States. She hopes to expand programs like the Edible Schoolyard and the School Lunch Initiative in order to reach schools across the US. She supports the Child Nutrition Reauthorization Act, and believes that providing all public school students with free food in school would build the foundation for a healthier and more sustainable food culture in the US. Since 2002, Waters has served as a Vice President of Slow Food International, an organization dedicated to preserving local food traditions, protecting biodiversity, promoting small-scale quality products around the world. She was drawn to the Slow Food movement because of its work in passing food knowledge and traditions to future generations. Waters, Alice (1984). Chez Panisse Pasta, Pizza, Calzone. ISBN 978-0-679-75536-4. Waters, Alice (1995). Chez Panisse Menu Cookbook. ISBN 978-0-679-75818-1. Waters, Alice (1996). Chez Panisse Vegetables. ISBN 978-0-06-017147-6. Waters, Alice (1999). Chez Panisse Café Cookbook. ISBN 978-0-06-017583-2. Waters, Alice; Paul Bertolli (2001). Chez Panisse Cooking. ISBN 0-8446-7110-X. Waters, Alice (2002). Chez Panisse Fruit. ISBN 978-0-06-019957-9. Waters, Alice; Carlo Petrini; William McCuaig (2004). Slow Food : The Case for Taste (Arts and Traditions of the Table: Perspectives on Culinary History). ISBN 978-0-231-12845-2. Waters, Alice (2007). The Art of Simple Food. ISBN 978-0-307-33679-8. Waters, Alice (2008). The Edible Schoolyard. ISBN 978-0-8118-6280-6. Waters, Alice (2010). In the Green Kitchen: Techniques to Learn by Heart. ISBN 978-0-307-33680-4. Waters, Alice (2017). Coming to My Senses: The Making of a Counterculture Cook. ISBN 978-0-307-71828-0. Waters has received numerous awards for her cooking, environmental advocacy, and other achievements. Elected to the American Academy of Arts and Sciences in 2007. ^ "Alice Waters". The Food Programme. December 1, 2013. BBC Radio 4. Retrieved January 18, 2014. ^ Straus, Karen Cope (June 1997). "Alice Waters: Earth Mother of California Cuisine". Vegetarian Times. Retrieved July 28, 2010. ^ CBS News (June 4, 2009). "Alice Waters' Crusade for Better Food". 60 Minutes. Archived from the original on July 28, 2010. Retrieved July 29, 2010. ^ Nozari, Elaheh (June 11, 2018). "8 Non-Cookbooks to Read This Summer". bon appétit. Retrieved June 13, 2018. ^ Dowd, Maureen (April 28, 2009). "Chef Waters' Vision Becomes Hot Topic". The New York Times via SunSentinel.com. Retrieved July 28, 2010. ^ Martin, Andrew (August 14, 1996). "Times Topics: People: Alice Waters". The New York Times. Retrieved August 5, 2010. ^ a b Burros, Marian (August 14, 1996). "Alice Waters: Food Revolutionary". The New York Times. Retrieved July 29, 2010. ^ "Chef Alice's Way of Life". pioneerchef.com. Archived from the original on July 14, 2014. ^ a b Burros, Marian (August 14, 1996). "Alice Waters: Food Revolutionary". The New York Times. Retrieved July 28, 2010. ^ a b Orenstein, Peggy (March 7, 2004). "Food Fighter: Food Revolutionary". The New York Times Magazine. Retrieved August 4, 2010. ^ Crawford, Leslie (November 16, 1999). "Alice Waters". Salon.com. Archived from the original on June 6, 2002. Retrieved August 4, 2010. ^ Waters, Alice; Liittschwager, David; Duane, Daniel (2008). Edible Education: a Universal Idea. Chronicle Books. ^ McNamee, Thomas (2007). Alice Waters and Chez Panisse. Penguin Books. p. 36. ISBN 1-59420-115-3. ^ Whiting, John (2002). "The Evolution of Chez Panisse". Retrieved July 29, 2010. ^ Olney, Richard (1994). Lulu's Provencal Table: The exuberant food and wine from the Domaine Tempier vineyard. HarperCollins. p. xi. ISBN 0-06-016922-2. ^ Janet Fletcher (October 27, 2007). "Cecilia Chiang's epic journey". San Francisco Chronicle. ^ "Cecilia Sun Yun Chiang". the Asian Pacific Fund. 2004. Archived from the original on January 4, 2010. ^ Meredith Brody (September 16, 2009). "Local Heavies to Celebrate Cecilia Chiang, the Julia Child of Chinese Cooking". SF Weekly. ^ Chez Panisse. "About Chez Panisse". Retrieved July 29, 2010. ^ "Cafe Fanny closing tomorrow after 28 years: 'It's just not economically viable anymore.'". The San Francisco Chronicle. ^ "The Food Revolution of Alice Waters' Chez Panisse". npr.org. Retrieved June 4, 2018. ^ Leavenworth, Stuart (May 28, 2009). "The Chef Apprentice: After 37 Years, Alice Waters Still Searches for a Slow Food Life". Sacramento Bee. Archived from the original on October 8, 2011. ^ Burros, Marian (August 14, 1996). "Alice Waters: Food Revolutionary". The New York Times. Retrieved July 29, 2010. ^ a b Chez Panisse. "Foundation and Mission". Retrieved July 29, 2010. ^ Chez Panisse Foundation. "Edible Schoolyard". Retrieved July 28, 2010. ^ a b Chez Panisse Foundation. "School Lunch Reform". Retrieved July 28, 2010. ^ Dowd, Maureen (April 28, 2009). "Chef Waters' Vision Becomes Hot Topic". The New York Times. Retrieved July 28, 2010. ^ Finz, Stacy (September 23, 2010). "School meals study provides food for thought". San Francisco Chronicle. Archived from the original on September 27, 2010. Retrieved September 28, 2010. ^ Burros, Marian (March 19, 2009). "Obamas to Plant Vegetable Garden at White House". The New York Times. Retrieved July 29, 2010. ^ Finz, Stacy (May 9, 2010). "Alice Waters' push for local, organic setting national agenda". San Francisco Chronicle. Retrieved April 23, 2014. ^ Chez Panisse Foundation. "Mission and Vision". Archived from the original on July 22, 2010. Retrieved July 29, 2010. ^ Gordon, Wendy (April 7, 2010). "Alice Waters: Chef, Healthy School Lunch Crusader". SimpleSteps.org. Retrieved August 5, 2010. ^ "About Us". Retrieved August 5, 2010. ^ "Our Mission". Archived from the original on October 21, 2008. Retrieved August 5, 2010. ^ Lander, Nicholas (August 14, 1996). "Why Women Excel in the Kitchen". The Financial Times. Archived from the original on August 31, 2010. Retrieved August 5, 2010. ^ a b c d e f g "Chef Alice Waters of Chez Panisse". StarChefs.com. Retrieved August 5, 2010. ^ a b c "Alice Waters". James Beard Foundation. Retrieved March 20, 2019. ^ Anderson, Lisa (May 7, 1992). "Beard Awards Tips Toque to Women Chefs". Chicago Tribune. ^ "Alice Waters – 2007". 2007. Archived from the original on May 27, 2010. Retrieved August 3, 2010. ^ Rayner, Jay; Cooke, Rachel; Miers, Thomasina (August 13, 2010). "50 Best Cookbooks of All Time". The Observer. London. ^ "The Rachel Carson Award Honorees". The Audubon Society. Retrieved March 20, 2019. ^ "Kofi Annan and Alice Waters to Receive Global Environmental Citizen Award". Harvard Medical School. December 10, 2007. ^ "President honors Alice Waters' vision of ethical food with medal". sfgate.com. Retrieved June 4, 2018. ^ Sanders, Robert (April 30, 2007). "Academy of Arts & Sciences elects 7 Berkeley faculty". Berkeley News. ^ "2008 Inductees". California Museum. Archived from the original on October 24, 2008. Retrieved May 24, 2008. ^ "New Design Futures Council Fellows Honored". Design Intelligence. October 6, 2008. ^ Eric Quiñones (June 2, 2009). "Princeton awards five honorary degrees". Princeton. Archived from the original on June 9, 2009. Retrieved June 3, 2009. ^ Brody, Meredith (August 4, 2009). "Alice Waters to Receive France's Highest Honor". SFWeekly.com. ^ Kahn, Howie (November 6, 2013). "Alice Waters Makes the World a More Edible Place". Wall Street Journal. ^ Hyman, Vicki (July 31, 2014). "N.J. Hall of Fame inducting James Gandolfini, Brian Williams, Dizzy Gillespie for 2014 class". New Jersey Star-Ledger. ^ Reichl, Ruth (April 23, 2014). "Alice Waters". Time Magazine. ^ "2014 Newly Elected Members". American Academy of Arts and Letters. March 20, 2014. ^ "Ten women added to National Women's Hall of Fame in Seneca". Localsyr.com. September 17, 2017. Retrieved September 28, 2017. Mcnamee, Thomas. Alice Waters and Chez Panisse: The Romantic, Impractical, Often Eccentric, Ultimately Brilliant Making of a Food Revolution. ISBN 978-1-59420-115-8. 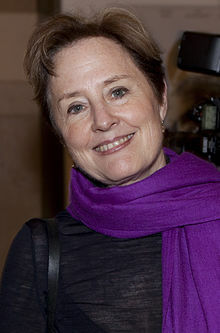 Wikimedia Commons has media related to Alice Waters.